It's finally time to retire my old laserdisc copy of Mario Bava's return to gothic form, as this promises to be a wonderful Blu-ray edition from Kino Classics. I first experienced Mario Bava�s 1972 film, Baron Blood when I blind-bought the laserdisc version of it many years ago. That ancient laserdisc was actually packaged as a �Double Feature� with Bava�s Lisa and the Devil, which I remember as the far more entertaining of the two. Bava�s career leading up to Baron Blood was full of excellent, giallo films (a subgenre further mastered by the great Dario Argento), including 1964�s Blood and Black Lace and 1970�s Hatchet for the Honeymoon, but this 1972 Elke Sommer-starrer was far too hokey for its own good. It�s also not nearly scary enough to be effective either, save for a nice, effects-laden final five minute sequence. Instead, much of the running time is filled with horrible acting that certainly isn�t helped by some horrendous English dubbing; a feeble attempt to hide some heavy Italian accents. Not even the presence of legendary character actor Joseph Cotton (Citizen Kane, Shadow of a Doubt) can save the day here, as he�s never really able to let his full freak flag fly, despite having a rather juicy role when all is said and done. Sure, it�s easy to argue that one doesn�t exactly flock to Bava films to supplement an acting class, but we can usually at least rely on his work to shock us enough into submission with frightful stories and imagery to distract us from the wooden dialogue and over-dubbing. 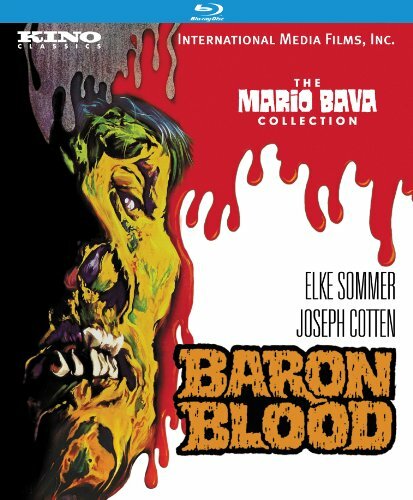 Baron Blood makes its Blu-ray debut on this, the latest addition to Kino Classics� �The Mario Bava Collection.� Saying that the film has never looked this good is a huge understatement, as this new 1080p transfer is leaps and bounds better than even the old laserdisc release. Taken from an original 35mm negative, the 1.78:1 presentation features nice improvement, as far as image detail goes, but, unsurprisingly, there�s still quite a bit of softness on display. Colors are more vibrant than ever, also, but don�t expect a kaleidoscope of bright, vivid hues dominating the transfer. There�s still some grain, dirt, and noise, but far less than the film�s fans have grown accustomed to through the film�s numerous home video incarnations. The audio is a Linear PCM 2.0 track, and, similar to the video, there are plenty of improvements, but also the inherent drabness that fans of the film won�t be shocked to hear. The overall mix is rather bland, staying up front and never featuring any directionality or bass presence. Despite the aforementioned horrendous English dub job, dialogue is never an issue, remaining crisp and clear at all times. The extras include an audio commentary track by Tim Lucas, author of the book, Mario Bava: All the Colors of the Dark. He spends most of the track going into great detail on the making of Baron Blood, including how Bava decided on the locations he used, and the many cinematic influences he utilized in making the film. There�s also the opening and closing Italian Title Sequences, which are a neat supplement, both the Italian and English Theatrical Trailers for Baron Blood, a trio of audio-only radio spots for the film, and trailers for the Mario Bava films Black Sunday, Hatchet for the Honeymoon, Lisa and the Devil, and The House of Exorcism.